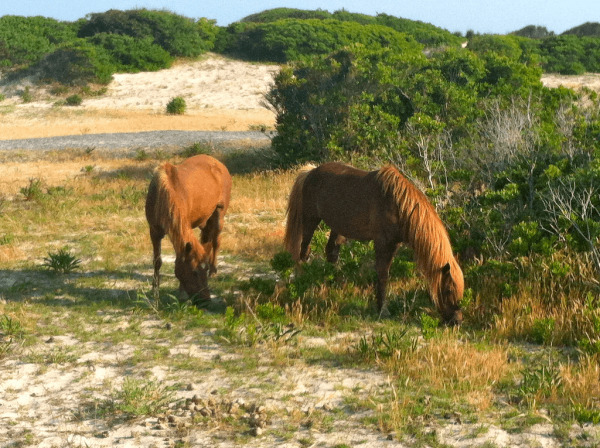 Where do Assateague ponies get their names? Located just 8 miles south of Ocean City, Maryland, Assateague Island National Seashore is a 37 mile long gem in the national and state park systems. Here, you’ll find information about Assateague’s history, parking and entrance fees, the wild ponies and other wildlife, camping, recreational activities, pet policies, Chincoteague, articles, photos, and more. With miles of beaches, bike paths, and and acres of undeveloped natural habitats, Assateague is a wonderful place to spend a day or whole vacation with. 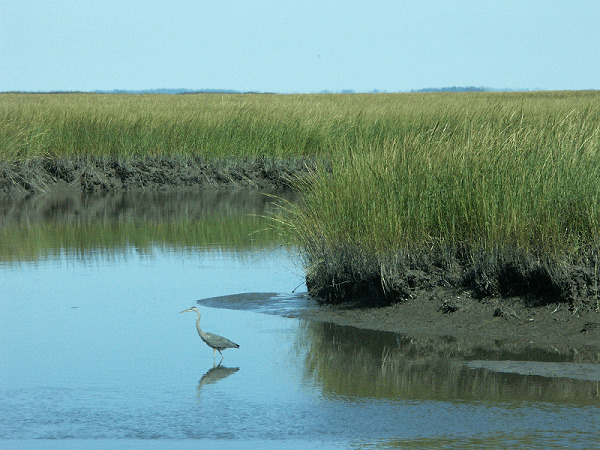 Wild ponies wander the marshes, birds chase the waves in search of clams and crabs unearthed by the water before they have a chance to dig back in, and brown pelicans skim the surface of the Atlantic. Large schools of fish can be seen off shore and dolphins play just outside the breakers. If you are lucky, you might even see a whale coming up from air between the waves and the horizon in the late summer. You can choose the State park where you can buy food and drinks and enjoy the comfort of a hot shower or the National park, which offers less amenities, but has outside showers, toilet facilities, and boardwalks crossing the dunes to the wide sandy beaches and the Atlantic Ocean. Camping of all types is available at both parks if you don’t plan to stay in one of the nearby Ocean City hotels. 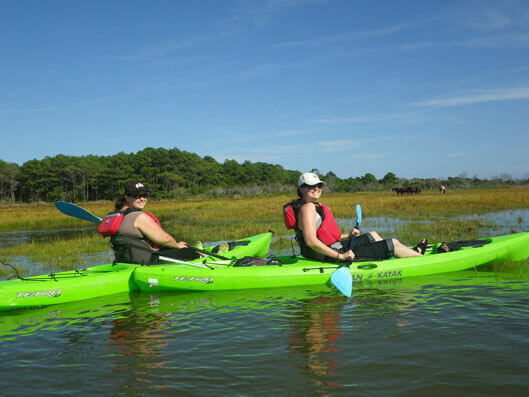 In addition to camping, fishing, and beach-going, there are a myriad of activities run by the Assateague park systems and their vendors to keep all guests well entertained and in awe during a visit. The origin of the Assateague ponies has always been portrayed as an unsolvable mystery. What is always mentioned is a legend that they swam ashore from a shipwreck of a Spanish galleon centuries ago. It was this legend that lured Marguerite Henry to Chincoteague in 1946. ‘Assateague’ is an American Indian word that roughly translates to “a stream running between.” The great hurricane of 1933 that cut the Ocean City inlet also created the island that is now known as Assateague. In 1950, a development was slated for a 15 mile stretch of Assateague Island on the Maryland side and a road, Baltimore Boulevard, was constructed to access the newly created lots. In 1962, a storm destroyed most of the existing buildings in the development and damaged most of the road or left it buried in sand. By this time, Maryland supported the idea of creating a national seashore and introduced new legislation to protect the island and prevent the redevelopment, which was passed in 1964 and created the Assateague Island National Seashore. Coastal Living magazine has voted Assateague as one of the Top 10 National Seashores and Lakeshores and the State Park at the northernmost end of the island was designated by National Geographic in 1994 as one of the 10 best state parks in the nation. The United Nations designated Assateague as a World Biosphere Reserve and the U.S. Department of the Interior designated it a National Natural Landmark. No road runs North to South along the entire expanse of the 37 mile island so you have to access the parks either through the Verrazzano Bridge at the north end or through Chincoteague National Wildlife Refuge entrance on the south end. Now, the National Park Service, the US Fish & Wildlife Service and the Maryland Department of Natural Resources work together to help protect Assateague Island’s resources for public enjoyment. Treating myself out to a day of photo adventuring for an off-season afternoon on Assateague. First off, because it is so nice to get out to the ocean, even when it is chilly. Second off, because it is a great excuse to parlay the day at the beach into a Happy Hour Adventure. The State Park is Maryland’s only ocean park and is the closest park to Ocean City, MD. Travel East on Route 611 and you will see the new visitor’s center on the right just before you cross the bridge to the island. If you go straight, you will pass the road that takes you to the National Park entrance. You will see a circle in front of you and a small road to your right that gains you access to the parking for Assateague Island State Park. The state park has a bike trail, marina and boat launch, nature programs, camp sites of all types, a camp store, dumping station, food and beverages for sale in season, fishing, swimming, a nature center and kayak rentals. Life guards protect the beach from Memorial Day to Labor Day from 10 – 5. Public access to the beach and the day use parking lot is open from 9:00 a.m. to sunset, 7 days a week. There is a per person fee to enter the park or you can buy an annual pass for the car. The Assateague Island Visitor’s Center is located on the south side (right hand side as you approach the ocean) of Route 611 just before you get to the Verrazzano Bridge. The visitors’ center is open year-round from 9:00 am until 5:00 pm daily only closing on Thanksgiving and Christmas days. The exhibits in the visitors center include aquariums, touch tanks, maps, exhibits, and a film about the wild horses of Assateague and Chincoteague. Restrooms, a gift shop, lost and found, and emergency services are available as are regularly scheduled and special programs for information on the island. The National Park office actually on the island is located inside the gate and offers campground information and registration, back-country camping permits, hunting information and over-sand vehicle permits. Entrance fees are necessary and the fee schedules and many passes available can be found by clicking here. Holders of the Parks and US Forest systems “Golden Eagle” pass get unrestricted access to the national park. For others, a modest entrance fee – currently $20 – allows for three days of unrestricted access into the park. The state park charges fees based on season and the number of people coming into the park; check with the entrance ranger for current entrance rates. Day passes in season are available to the State Park for $3 and entrance is free after 5 pm. Please check the state park and National Seashore sites for more information. There is parking at both the national and state parks, close to the visitor centers. Make sure to lock up the vehicles and do not leave anything valuable in sight. Do not leave pets in locked and parked cars as the temperatures may approach dangerous levels for pets left unattended for extended periods of time. There are 350 campsites in the state park, each with a fire ring and picnic table. You can tent camp or bring your camper. There are electric hook-ups on one loop. Youth group camping permits and areas are also available. There is primitive camping in the State Park from November through April and permits only cost $10/night. You must be in a self-contained camper to use these areas as no tent camping is allowed where bathroom facilities are not available. For more information, check the DNR website: http://www.dnr.state.md.us/publiclands/eastern/assateague.asp or to make reservations, call 1-888-432-CAMP(2267) for reservations. Camping is also available in the National Seashore where there are many camping options. All campsites include access to cold-water showers, chemical toilets, and drinking water. From 10/16-4/14, campsites are available on a first-come, first-served basis. The cost per night is $20 and discounts are available. Oceanside Drive-in Camping: Tents, trailers, and recreational vehicles (no hook ups). Sites have a picnic table and upright grill. Oceanside Walk-in Camping: Tent-only sites, located 100-200 feet from centralized parking areas. Sites have a picnic table and an upright grill. Bayside Drive-in: Tents, trailers and recreational vehicles (no hookups). Sites have a picnic table and ground fire grill. A Drive-In “Generator-Free Zone” is located in Bayside B Loop. Group Camping: Organized clubs and affiliated groups must use group campsites. Tent-only sites, located 100-200 feet from centralized parking area. Sites have a picnic table and an upright grill. Group campsites can be reserved year round, up to 6 months in advance at $40 per night per site. Visit our camping page for more information. The state park allows pets in the boat ramp area, so you can take your furry friends out on the boats with you, and they are allowed in the day use areas off-season. Pets are allowed in the front-country campgrounds, but they must be leashed at all times and are not permitted into any area where there is sensitive habitat or wildlife. If you are unsure what areas these are, ask a ranger. Clean up after pets and make sure all dog wastes is disposed of in the special trashcans within the park boundaries. 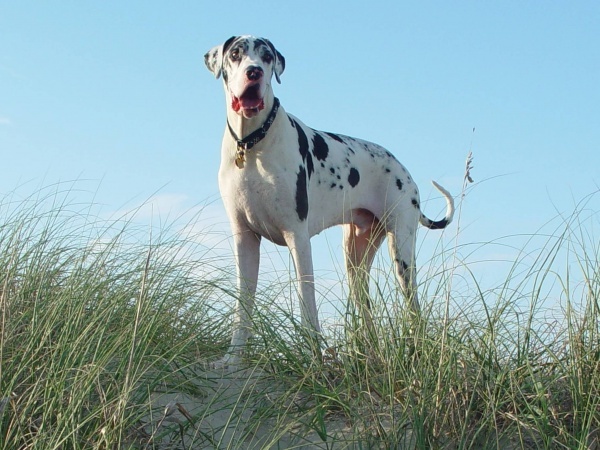 The National Seashore allows pets on a leash less than 6 feet only. They are not allowed on the guarded beaches, on the nature trails, or at any of the back-country camping locations. You are not allowed to have a pet with you North of the state park or in any of the Virginia section of the park — accessible through Chincoteague. You may not even have a pet in your car in Virginia park area. Legend has it that when the Spanish explorers were sailing this part of the North American coast, there was a shipwreck and several of the Spanish ponies swam to the islands around Assateague and Chicoteague. This story adds to the allure and wonder of the region, but is apocryphal. Most likely, the ponies were originally owned by residents and developed into a separate feral herd in the 17th century . During any trip, expect to see several of the wild horses (as they are known on Assateague) or the wild ponies (made famous by Misty of Chincoteague) known for their patchwork coats and stubbly legs. Foals are born in the Spring and you can expect to see this frisky youth following their mothers around the island. There is a fence along the island that separates the Maryland side of the island from the Virginia side, and this keeps two different herds of the ponies separate, ensuring healthy DNA populations of the equines. In Virginia, the horses are owned by the Chincoteague Volunteer Fire Department and in Maryland they are owned by the Park Service. Each year, the members of the fire department known affectionately as “Assateague Cowboys” herd the ponies across the water on the last Wednesday of every July. These ponies are auctioned off and any not sold are returned to the island. While Chincoteague is known for the ponies world-wide and they still host the annual pony swim and auction each July, the Maryland end of the island has just as many wild ponies and they are usually easier to see from your car. They wander the marshes, beaches and roads, so please enjoy them, but do not touch or feed them. Huge fines are levied and significant injuries have occurred from kicking and biting ponies. They are wild — so please help keep it that way. Bird watchers and lovers enter an avian paradise when visiting Assateague Island. Great blue heron, egrets, cattle egrets, bobwhites, glossy ibis, mute swans, and a variety of terns and gulls surround the waters and sedge grasses of the island. Avid birders are able to nick-off up to 200 different birds that frequent the island. Both resident and transient species of birds are sighted around Assateague, and during the migrations it is possible to see flocks of sea birds up to 10,000 strong. Bring a powerful pair of optics and settle in for a great day of bird watching on Assateague. While the ponies are the main draw, there are a variety of other terrestrial animals found throughout the Assateague region. Sitka deer are the second largest animal on the island and are readily seen throughout the wetlands and marsh grasses on the edges of the island. Sitka deer are slightly smaller than the larger white-tail deer so common to much of the eastern United States. One of the more unique and protected species on the island is the Delmarva Fox Squirrel. This rodent is a slightly larger and whiter sub-species of the common grey squirrel, and is seen only on Assateague and surrounding islands. Keep the camera handy as sightings of this squirrel are rare and special. Keep an especially keen eye out for these critters along the Wildlife Loop. Raccoons, the masked bandits, are also residents of Assateague. While they are always fun and entertaining to see, they are notorious pests and scavengers. Because of this, there are very strict rules on Assateague regarding food and camping. While the raccoons are cute and will beg, never feed them as this makes them used to human contact and turns them into pests around the camping areas. Guided nature walks are available through the park’s visitor center. A park naturalist leads trips along the Assateague trails, giving interpretation on the flora, fauna and ecosystems of the island. If you want to venture out on your own, free maps of the trails on the island are available at the visitor center. Check in with the ranger desk to find out about any current closures or recommendations. Be sure to bring a hat, gloves, sunscreen and extra water and food when heading out into some of the more remote trails of the island. There are several independent guiding companies that run horseback tours of the island. Imagine taking the time to mount up with horse guides, and riding through the island wilderness. These tours are booked in Ocean City, and make a wonderful way of seeing the island. Half-day, day and multi-day horse camping trips are available. You can also bring your own horse for day riding. This is allowed during the cooler months when the threats of insect borne equine diseases is very low. Surf fishing is allowed all year, but you must fish outside the guarded beach areas in season. You can also fish from the boat launch facility on the mainland side of the bridge. Fishing and clamming are allowed in the bays. A license may be required for some of your fishing activities. Please check the DNR Licensing & Registration Service for details on fishing licenses and the Maryland saltwater angler registry. Please refer to the Maryland Department of Natural Resources Fishing Guide for state regulations on size of fish you can keep. You can download the guide here. Like the horseback tours, there are guided sea tours that take you around parts of the island in sleek ocean-going kayaks. There are half-day, day, and multi-day trips available. Keep your eyes out on the water as well as the land, as dolphins and marine wildlife are frequently sighted during kayaking excursions. You can also rent boats across from the Visitor’s Center or from one of several local outfitters. Assateague is known for some of the best swells in the region and can challenge the most seasoned surfer under the right conditions. If you don’t own your own surfboard, you can rent them and catch some waves around the islands and parks. Like most activities in the parks, check with rangers for any current closures or updates for surf, swells and currents and check out our Beach Safety page for more information. The southern end of Assateague Island spills into Virginia and is home to the Chincoteague National Wildlife Refuge and the famous wild ponies of Chincoteague. The ponies inhabit the marshes, wooded areas, and beaches of the entire island. These wild horses are descendants of those that were brought to the island in the late 17th Century. Some say they swam from a ship-wrecked Spanish galleon, more likely, they are the descendants of horses that locals let run loose on the island. Either way, they are beautiful and wild — a rarity in today’s heavily developed world. A trip to Assateague is not only fun, it is highly recommended as one of the most beautiful and interesting things you can plan while visiting Ocean City, Berlin or any of the surrounding areas. If you are planning on staying in one of the hotels or rentals in Ocean City, Assateague is an easy drive and should not be missed. Bring plenty of sunscreen and bug spray, and keep your camera or phones ready because the photo opportunities around this region are plentiful. Click here to check out guides to the area.